In the realm of health news, the word Salmonella provokes an immediate wince in members of a public broadly familiar with its intestinal-disruption symptoms and ease of transmission. But thanks to genomics-driven innovations in microbiology and foodborne pathogen research, there’s now good news about Salmonella. Salmonella causes an estimated 93 million illnesses and 150,000 deaths around the world each year. It continues to infect 88,000 Canadians each year with a cost to the Canadian economy of $1 billion annually. Profs. 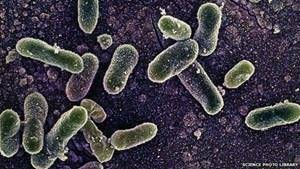 Lawrence Goodridge of McGill University and Roger C. Levesque from the Institute for Integrative Systems Biology of Université Laval, are leading an international team of 30 researchers actively sequencing the genomes of 4,500 Salmonella strains worldwide. Armed with the forensic information that sequencing is revealing, Goodridge and Levesque are developing natural biocontrol approaches to reduce the presence of Salmonella in fruit and vegetables before they are harvested; creating new tests to improve the speed and efficiency with which Salmonella is detected on fresh produce before it is sold to consumers; and improving methods for tracking contamination sources during outbreaks. The innovations in tracing the source of contamination improve upon the existing Salmonella tracking process, Pulsed-field Gel Electrophoresis (PFGE), so that contaminated food can be more quickly removed from grocery stores and restaurants, reducing the magnitude and duration of outbreaks and the human suffering and economic cost they produce. The project, officially named A Syst-OMICS approach to ensuring food safety and reducing the economic burden of salmonellosis, is a model of the 21st-century research, which is now harnessing genomics to find answers that would still be hidden without it. The team has already sequenced approximately 3,000 Salmonella isolates from 22 countries. 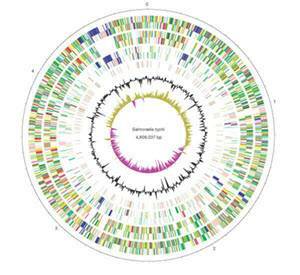 A notable strength of the project is the practical applications that are being developed from the genomic data. For example, the biocontrol method to reduce Salmonella on fruits and vegetables is based on the use of bacteriophages — naturally occurring viruses that replicate and infect within bacteria — that are emerging as a natural alternative to the use of synthetic chemicals such as pesticides. In diagnostics, a new genomics-based test is being developed to confirm the presence of Salmonella in fresh produce (and other foods) and the new test will not only provide information about the type of Salmonella (its serovar, or serotype) present, but will also detect the presence of antibiotic-resistant genes, and will provide information regarding the potential for the Salmonella in question to cause human illness. Also, the team has been collaborating with the Public Health Agency of Canada to validate the use of whole genome sequencing — the mapping of a single organism’s entire genome — as a more specific approach to identifying the food sources associated with outbreaks of salmonellosis. They’ve made significant progress toward the development and validation of four different but complementary whole genome sequence analysis approaches to use during foodborne outbreak investigations. That revelation counts among the major new insights into Salmonella since American researcher Theobald Smith first isolated the bacterium in 1885, naming it after his supervisor, veterinarian and food safety pioneer Daniel Salmon.